Sunday, June 12th, 1994 is a date more commonly associated with the beginning of the O.J. Simpson media circus, but what I remember is that the Barnes & Noble in Charlottesville had its grand opening on the 10th, and this was my first time visiting the store. The book I bought that day was Indians ‘R’ Us, a collection of essays and articles by the not-yet-infamous Ward Churchill. One of the chapters, an excoriating attack on the poet Robert Bly, dealt with the topic of what would today be called “appropriation” of Indian culture by white people. 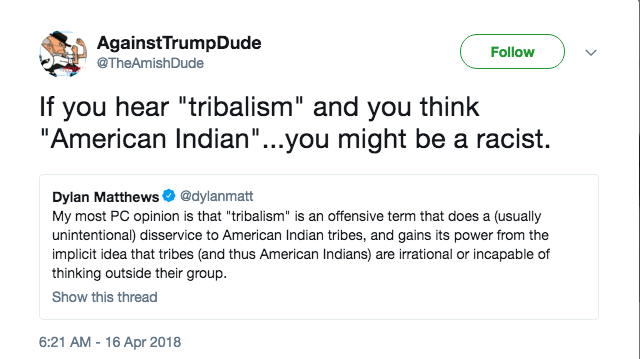 In it, Churchill (who, ironically, would later be accused of having fabricated his own Indian heritage) not only argued that white people looking to reject their oppressive colonial European heritage should stick to romanticizing their own barbarian ancestors (“Proud to be a Visigoth-American!”), but that the word “tribe” was especially offensive because it was formerly used in reference to livestock, thus equating non-European people with cattle. Cattle=>cattle cars=>genocide=>Nazi Germany=U.S.A. Q.E.D! Again, 1994. Dylan Matthews and the rest of the Vox Media cohort were probably busy tattling on the naughty language of their seventh-grade peers and doodling heroic portraits of Bill Clinton on their Trapper-Keeper notebooks back then, blissfully unaware that a quarter-century later, their every banal thought would have already been voiced by a soon-to-be disgraced ethnic studies professor. I’m trying to imagine the appropriate inverse of the old “dwarfs standing on the shoulders of giants” image and failing. Point is, besides the fact that there is absolutely nothing new under the left-wing sun, by resurrecting this idea, Dylan Matthews, and by slippery-slope extension, Ezra Klein and Matt Yglesias and all the rest of the interchangeable Voxplaining millennial media morons, have placed themselves in rhetorical solidarity with the man who infamously called the people working in the WTC on 9/11 “little Eichmanns,” while implicitly endorsing his own appropriation of Indian culture as well. I’m pretty sure that’s how this guilt-by-association thing works. Now, even those of us who wouldn’t have read Vox even if you’d paid us have to feign an attack of the vapors and loudly announce our intention to withhold money we weren’t going to spend from companies we never patronize for advertising on a website we never visit while patting ourselves on the back for our moral integrity; the offending parties need to be placed under economic embargo until they’re forced to resign; and they can never hold a job that pays more than eleven dollars an hour again. Hey, I don’t make the outrage-mob rules, I just observe them.